Yay! I am getting a new bed. I am finally going to be able to sleep through the night. No more pains in my back. Plus, plus the new big is going to be bigger. These are all reasons to be very excited. One of the important things to do is to pay some attention to the actual bed frame. There are a lot of simple bed frames but there are some really suffisticated type bed frames. Some of these bed frames and machanics and provide the consumer with more comforts. The old style bed frames include a base which is used together with the mattress. These old style bed frames came with a lower profile or the mattress itself can have a higher profile. In order maintain the warrantee of the mattress you have to all was use the old style bed frame. Really, I have never heard of anybody taking a mattress bace because they want to exercise their right based on the warranty. Really? But I am getting off the subject. If you look around or pay attention you will see that most of the traditional bed spreads are metal. These metal frames normal have a couple of adjustments that allow you to adjust the bed frame that of the box spring and mattress. In some cases you will see that these frames come with wheels. This was very helpful or wood or tile floors. I remember when I was a teenage my brother had a platform bedframe in the basement. I remember thinking that was so cool. These platforms are made with slats or a hard plastic structure. My brother’s platform was made of sturdy wood. This was a new style and is know as contemporary. They are now made in a variety of styles that include old style and modern style. If you’re thinking about skipping a box spring or buying a foam mattress, make sure your bed frame can support it. Over the last 10 years there has been a lot of new technology developed for bed frames. Mechanical frames that lead to a large variety of comfort variations. These lead to being able to adjust portions of the bed for your head to your foot. It is really exciting. Note however, in some of the estates cleanout jobs these beds can be quite heavy. Most of these types of bed frames are all inclusive for a frame and some even fit inside your existing bed frame. This allows you to be able to maintain the look that you like while giving you great new technology. You can even get the Cadillac of bed frames with lights and computer ports and that warming massage sensation. Awesome!!! 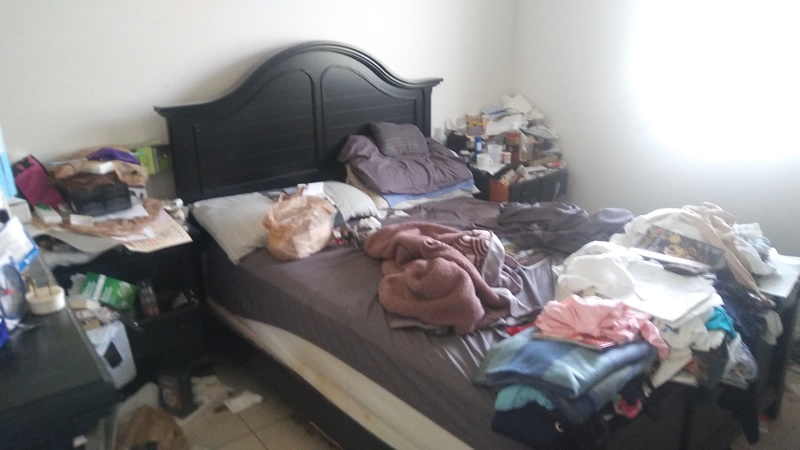 Estate Cleanout Services of South Florida help customers to sell and remove these types of beds from their (mostly) parent’s homes. We clean the home, repair it and paint the home to get it ready to be sold or rented.